This entry was posted on October 28, 2013 at 2:07 pm and is filed under 2013 Giller Prize, Author, Vyleta, Dan. You can follow any responses to this entry through the RSS 2.0 feed. You can skip to the end and leave a response. Pinging is currently not allowed. I’m curious as to what your opinion was of Crooked Maid, Giller – wise. Do you think it is worthy of being on the Giller short list? I read and enjoyed The Quiet Twin by the same author and very much enjoyed it.I close to the end of the Crooked Maid and while overall I’ve enjoyed it, the Quiet Twin is definitely the better of the two. Though the plot is convoluted in the Quiet Twin it was a great read. 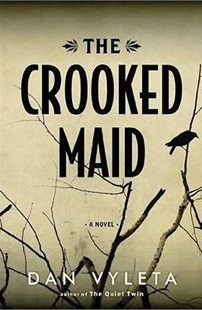 The Crooked Maid seems to have a plot that moves more slowly and is less rewarding of a read then The Crooked Maid. I don’t want to give away my ranking (you’ll have to wait a few days for that) but I certainly think The Crooked Maid belongs on the Giller shortlist. Your comment (and David’s) have left me somewhat glad that I did not try to hastily read The Quiet Twin first. While the two books seem to have some things in common, they also seem to take very different points of view and have quite different ambitions. I will get to The Quiet Twin in a few months. I chose to read ‘The Quiet Twin’ prior to ‘The Crooked Maid’, purely because both sounded good and I was reading them for my own enjoyment primarily rather than to judge the second book as part of the Giller shortlist. And I’m glad I did. Whilst the two definitely work independently (there is no continuation of plot from ‘The Quiet Twin’ and only two characters – Anneliese and Anton Beer – directly carry over from the first book) viewing them as a pair adds another dimension to Vyleta’s achievement. ‘The Quiet Twin’ was set in 1939, a time of fear and suspicion which Vyleta brilliantly evokes by setting almost the entire story in one block of Vienna flats where everyone is watching everyone else – it is almost claustrophobically tense. With ‘The Crooked Maid’ the focus shifts to 1948 and Vyleta flips the set-up on its head, opening the book out to encompass the whole sprawl of Vienna with many characters spending much of the book searching for people or hiding themselves away: it lends the book a completely different atmosphere, still shadowy and ripe with suspicion, but very different to ‘The Quiet Twin’. I thought the way Vyleta introduced a largely new cast in the second book was a wise move – not only do they represent the reader who is coming to the second book cold with no knowledge of what has passed before, but it also means he can take stories from ‘The Quiet Twin’, which we thought were resolved, and turn them into fresh intrigues. A perfect example of this is the picture of the woman on Dr. Beer’s wall – readers of ‘The Quiet Twin’ (just like Anneliese/Eva in the novel) will know the relevance of that picture, but Anna Beer doesn’t. Nor does she ever find out, and rather than offer up an explanation which would just recap the events of ‘The Quiet Twin’, Vyleta instead uses her ignorance as a strength: even though that picture isn’t part of her life, she chooses to respect and to honour its history, which seems to me to be very much what Vyleta himself is doing with these novels. In terms of the Giller I’m having trouble trying to assess ‘The Crooked Maid’ on its own merits as the two books are now inextricably bound together in my mind; and though in many ways – especially in the plotting which Vyleta seems to have become even more adept at juggling – this is a more skillful book than ‘The Quiet Twin’, I do slightly agree with Deborah’s comment above: there was something about the first book that I preferred. Still, I think either this or ‘Cataract City’ would be my favourites from the shortlist. Anyway, do read ‘The Quiet Twin’, Kevin – reading ‘The Crooked Maid’ first won’t spoil anything, and there is one thing that a character is told in ‘The Crooked Maid’ that seems like the truth, that you will discover is actually only half the story. As most things are in these two books. Thanks for that concise comparison and discussion of how this book relates to The Quiet Twin — I obviously could not do that but I am sure those who have read both novels appreciate it. You tend to confirm my impression that the two are more side-by-side novels with some overlap rather than chronological volumes in an ongoing story. And from what you say, it strikes me that a reader preference in the two is going to mainly be based on taste since both are well-executed — those who like Dostoevskian sprawl would lean to this one, those who prefer a more intense, contained narrative The Quiet Twin. You may find the “challenging” aspect of this one a positive, rather than a negative. I used the word because of the complexity of the plot as the author introduces it which makes the first section a bit confusing until all the story lines have been developed. On the other hand, Vyleta does that in relatively short chapters that are fairly self-contained — so he is actually putting together a number of stories at once which come together late in the book. I did start reading this on Melbourne Cup weekend and have just finished it. I didn’t have any trouble getting into the book but I agree that the plot took some attention – as you say, in a positive way. I loved the scope, the characters, the story line and the sense of place. I felt like I would recognise the characters if they passed me in the street! A great read and now I must get my hands on The Quiet Twin! Glad you enjoyed it. A few weeks on, for me this is one of those novels that is aging very well. The way you’ve pulled out quotes for each character is an enticing way of approaching the discussion and showcasing his style. I was thrilled to see this one advance to the shortlist; the intricacies of the storytelling are wholly satisfying and I was swept up into the story as completely as I had been with The Quiet Twin. I wish, now, that, like David, I’d read them in closer succession (I read TQT upon publication) but even though I can tell that I’ve lost track of a lot of the plot details, I still recognized relationships between the stories that brought another layer of enjoyment/depth to the reading of TCM. This is a definite favourite for me, too, but I can’t say much more than that at this stage, with both Moore’s and Hamelin’s novels ahead of me yet. Did you find that it read more quickly or slowly than some of other G books this year? For me, it was certainly one of the “slower” reads. The novel features a number of story lines, each of which is important, and Vyleta moves from one to the other so I found myself frequently having to engage in some mental reminders. Also, in Dostoevskian fashion, he is quite deliberate in what he lets us know about the major characters and their individual stories — that too slowed the reading down somewhat. I don’t mean that as a criticism — indeed the contemplation and reminding helped to underline the depth of the story. Like you Kevin I’m not a Dickens fan, so the Dickensian description rather put me off this. I noted though that it worked for you even though you’re not a Dickens fan, and David’s comment above makes it sound really interesting in terms of how it connects to The Quiet Twin. All of which means I shall check out The Quiet Twin, and if that works for me return to this. Thanks for the review as ever Kevin. I still have not got to The Quiet Twin myself, I have to admit. I do remember parts of this one very well.